This week were joined again by people’s champ builder John Repetto of the Eazy Co in Worcester, MA and special guest Astroman1985 to talk about the bike John and Craig Kenyon are building for this years people’s champ. As always, we also get into the weeds on camping, hammocks and looting cranberry fields for vintage sprinter front ends. This week were joined by Tyler Malinky, Founder of Lowbrow Customs. We talk about how motorcycles became a part of his life, The build that secured his landspeed record at the Salt Flats, and even an exclusive announcement here on the Lowlife Chopper podcast that you’ll have to listen in to hear. This week we talk with two local builders @Dogfood_Lid_ and @Fishtankwhisky out of Manchester NH aka “Queen City.” From badass seatless evo chops to vintage triumphs, this episode has a little something for all the garage builders out there. This week we sit down with Amy of Babes, Bikes & Beards to talk about her bugout bike build for the greasy dozen and all the skills it takes to build something truly unique. Enjoy! This week were joined by Bill Bryant, Co Founder/Brand Manager of the iconic Biltwell brand to discuss how motorcycles became a part of his life, navigating the motorcycle landscape and saving the legendary People’s Champ competition we’ve all come to love. This week we talk with Born Free 10 and 11 builder Hawke of Vintage Technologies about his off the wall knuckle and shovelhead builds, how he got his start and what’s in store for him in the future. Enjoy! This week we chop it up with Maine chopper builder, rider and editor/creator of the MotocompoMag zine. Catch everything from his pre unit collection to the beginnings of his northeastern based zine and what he likes to feature. This week we chop it up with Curt (@4th_floor_choppers) who takes us through his progression from your average American Ironhead owner to a 2nd time born free invited builder and where his journey all started. Some key highlights on this show include how he manages to pull parts from iron heads, shovelheads, panheads and more and mix them all into one single machine. You won’t wanna miss this one! This week we sit down with the crew from @Dirtybuilds out of good ol CT. We talk powdercoating, wheel lacing, hilarious hack stories and more. Enjoy! This week we chop it up with one of our all time favorite builders, Christian Newman. We talk about his born free winning stainless knucklehead, turbo shovelhead, favorite shop tools and how it all got started for him. This week were joined by Matty (@fauxsmobile) who gives us some golden nuggets on getting your tins ready before the riding season begins and much much more. This week were joined by the talented @jshia, owner of @MadhouseMotors in the Alston area of Boston, MA and co worker (and owner of one hell of a Boston accent) @acewithaj. The pair talk about how the shop got started, some of their out of the box builds and more. Enjoy! This week we talk metal prep, CP gives a savage update, Grease chops up some road star progress, the gang pretends to understand points and much more. Enjoy! This week we go over where to start when your chop refuses to, what we’ve been up to on our bikes lately, some tips on what you need to start TIG welding today and more! This week we go over come upcoming event and sit down with Chopper Bob to talk tech on his race bike and pan builds so PAY ATTENTION! This week was a big one! We talk about two previous podcast guests who got selected for the Greasy Dozen, a good friend who will be building a bike for the people’s champ section of born free and talk shop with Wes, host of the chop and roll podcast and previous host of Riders on the Norm! This week on the show we recap our winter chop luck sponsor shindig, and sit down with the man behind www.chopshit.com, Chicken Rick. This week were joined by Michael from Voodoo Vintage to discuss his path leading up to motorcycles, how he came to own Voodoo Vintage and where he plans to take the company in the future. This week on the podcast we’re joined by new sponsor @Fatman_Custom_Motors who takes us through his career as a professional mechanic turned small business owner, along with some tips for improving your tool setup. This week on the podcast we talk about our thanksgiving plans, how to properly hunt deer while eating chips, Harley and the Davidson's and more. As always thank you to our sponsors for making the show possible, and happy thanksgiving from all of us at Lowlife Chopper Podcast! This week on the podcast we talk about how and why our bikes continue to remain not running and take calls from our new sponsor Famous for Nothing, and longtime listener 5814 SpeedCo joins us to talk about a frame jig he designed for the average joes out there looking to up their game on future builds. As always thank you to our sponsors and our supporters for making this show possible. Keep it sketchy! On this week's episode, we're joined by 3 special guests...one who you've heard before and two who you've likely also heard, but never on our show. Listen in to find out who we had the pleasure of chopping it up with this week. As always, a huge thank you to our sponsors... www.chopshit.com Babes Bikes Beards Krazy Kustoms And to our generous supporters Steven L, Mandi, Patrick S, Albert H & Randall M. If you'd like to join them in supporting our show, you can do so at anchor.fm/lowlifechopperpodcast/support. This week on the podcast we are joined by Nick Ferrero, chopper builder and rider out of Manchester, NH who takes us through his trip out to the Catskill Mountain Thunder event in NY. 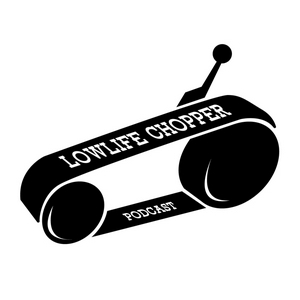 If you enjoy the podcast and want to help us continue to bring it to you weekly, please consider supporting us at https://anchor.fm/lowlifechopperpodcast/support. As always, thank you to our sponsors Krazy Kustoms, Babes Bikes Beards and our supporters Steven Loiselle, Albert Honaker and Amylynn Arrington. This week we get a little freeform and talk about everything from camping to guns to swap meet finds and more. As always, a huge thank you to our sponsors Krazy Kustoms (@KrazyKustoms) and Babes Bikes Beards (@BabesBikesBeards) as well as our donating supporters Albert Honaker, Steven Loiselle and Amylynn Arrington. For those of you enjoying that show that would like to join them in making a donation, you can do so at https://anchor.fm/lowlifechopperpodcast/support. Chopper Bob (@NHchopperbob) joins us in a two hour chopper talk extravaganza where we hit on build inspiration, vintage ironhead tips, the chopper community over the years and much much more. Plus a few XS build updates from Grease and some big news from Loctite! Also, if you're liking the show and want to help support us in bringing it to you each and every week, please consider becoming a sponsor at https://anchor.fm/lowlifechopperpodcast/support. Any and all contributions are massively appreciated.